Open Box Unit. Like new condition in original box with all parts and instructions. The Lighter Weight Aluminum Frame HoundAbout II! **Please check the "Sizing Guide" tab above to make sure you purchase the appropriate size dog bike trailer to fit your dog/s based on the trailer dimensions - not just the weight limits. A dog bicycle trailer is the perfect way to let your best buddy take an extended bike ride with you. The Houndabout II design features an extra-wide wheelbase and a low center-of-gravity to provide outstanding ride stability and easier access for pets getting in and out of the cabin. Special pockets hold plenty of gear including cellphones, keys, leash, water bottle, treats, and more. The front door on the trailer includes a zippered, mesh screen layer plus a zippered, clear vinyl layer to block wind and weather. Use them in different configurations depending on riding conditions. The over-sized sunroof provides ample airflow and room for pets to peek their heads out and look about. A removable, washable cushion keeps pets comfortable on long rides. Assembles quickly and folds down for easy storage or transport. I first started looking into dog bike trailers when I wanted to take my miniature schnauzer along with me on bike rides. She is too small to really enjoy one of our dog bike leashes and I felt bad having to leave her behind when I take Parker biking. 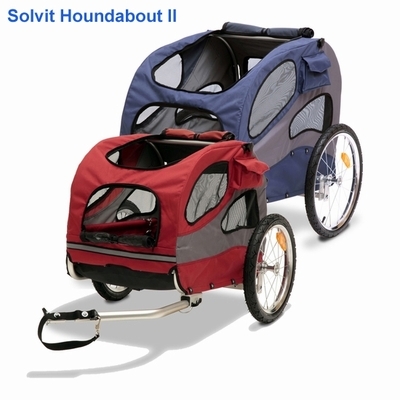 The Solvit HoundAbout II dog bicycle trailer was the perfect solution. These trailers are built especially for dogs. The large dog bike trailer is even great for when Parker gets tired of running alongside the bike. He just hops in and takes it easy. The medium trailer holds a maximum of 50 lbs (this does not mean that a 50 lb dog will fit comfortably - please refer to the Product Specifications tab above to see dimensions to determine if your dog will fit). The large dog bike trailer holds up to 110 lbs. 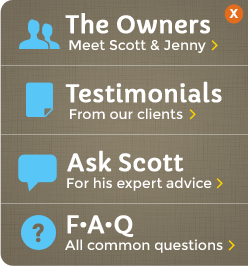 Again, please check the Solvit Product Specifications tab above to make sure you purchase the appropriate size bike trailer to fit your dog/s based on the trailer dimensions. Solvit Dog bicycle trailers are also great for older dogs that want to still be part of the fun. Check out the features that make the Solvit Houndabout II dog bike trailer the perfect bike accessory for your pup below. Constructed from rugged 600d polyester with waterproof floorboard. **Please note that the Solvit Houndabout trailer maximum weight limit should not be used to determine if your dog will fit the trailer. The medium dog bike trailer holds a maximum of 50lbs, but this doesn't necessarily mean a 50lb dog will fit. Please see the product dimensions below to ensure enough room for your dog/s. The same goes for the large trailer. Please use the weight limit as a guideline for total weight the trailer can handle, but use the dimensions to determine if your dog will fit. If in doubt it is always better to have more room than have a bike trailer that your dog cannot comfortably fit in. Extra Dog Safety Strap - Keep an extra on hand or for taking 2 dogs in one bike trailer. Extra Hitch - Use an extra hitch on a second bicycle to quickly be able to switch the Solvit Houndabout dog bicycle trailer between 2 or more bikes. Solvit Stroller Adapter Kit - Convert your bike trailer into a pet stroller with this accessory kit.